Achieve new levels in productive scan performance. Scan 35mm negative film fast, at approx. 18 seconds per frame (1200 dpi), or scan an A4 colour photo or document in approx. 7 seconds (300 dpi). Start scanning straight away, without waiting, thanks to zero warm-up time – and save power at the same time. Restore scratched, damaged, dusty and faded film with ease, without tedious manual retouching. 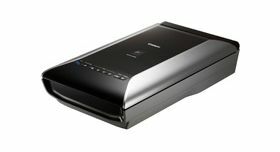 Canon’s unique FARE (Film Automatic Retouching and Enhancement) Level 3 technology - integrated in the scanner - does the job for you using an infrared light that scans for physical defects on the film surface. QARE Level 3 technology automatically restores damaged photo prints. Enjoy simple operation even for the most complex functions. 7 EZ buttons give you instant access to Auto Scan, Copy, Email and the creation of multi-page PDFs. The ‘Auto-Scan’ button recognises photo, document and film types, providing suitable settings for scanning and saving. Auto Photo Fix II and Auto Document Fix software optimises the output and quality of final images or documents. The built-in AC adaptor makes the unit more compact and reduces desk clutter. Powerful SilverFast SE, Adobe Photoshop Elements and ArcSoft PhotoStudio software comes bundled with the unit, making the most of your scans. Manage scanned files easily using Canon’s MP Navigator EX software. Convert documents to searchable PDFs, complete with password protection to safeguard confidential information. Another invaluable software function is Stitch Assist, enabling you to scan A3 pages by seamlessly stitching two A4 scans together.